Life is not easy even when people think it is. Unfortunately, sometimes they do not realize it and talk with such an easy going approach that you feel compelled to reveal them the deep truth about the complexity of even the tiniest actions. One not simply does stuff the right way and this might mean that the outcome will be completely wrong! This revelatory, a bit paternalistic meme originates from a popular scene of the movie “Lord of the Rings: The Fellowship of the Ring”, in which Boromir, High Warden of the White Tower, warns his fellow adventurers about the risks of entering in the region of Mordor to destroy the ring. Since you probably know the story, you realize also how his sentence “One does not simply walk into Mordor” was true and wise. One does not Simply create a Meme… Except This! One does not simply do stuff, but you are not a member of the Fellowship if the Ring (yet!) so relax: generating a meme at memegenerator.net is actually quite simple! Gather your strength and your courage, click one the “create a meme” button and prove yourself a real hero, writing the perfect advice for those who think that anything can be done easily. You can share your meme on Twitter, Facebook or wherever else you want since all our images are royalty free. If you wish to create something more unique, you can upload an image yourself and transform it in your personal meme. 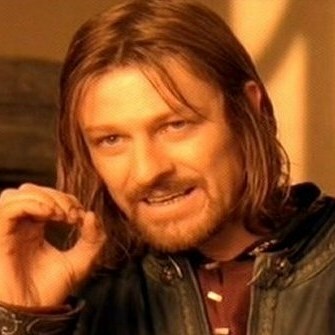 One does not simply create the next viral meme, but you can bravely try! One does not simply say "baby, baby, baby, ohh"